Not the most original cultivar name but its aptly descriptive. 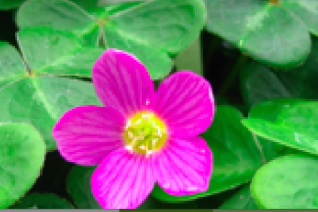 Vigorous evergreen ground cover with dramatic hot pink flowers for weeks in spring. Spreads by underground stolen in rich, fertile, woodland conditions with regular summer water. To 4″ high and spreading many feet across shortly (in ideal conditions) . Part shade to shade. Very easy native perennial to grow. 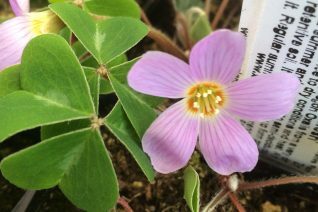 This is the second most vigorous Oxalis o. clone that we have behind ‘Klamath Ruby’. Simple pink flowers are pretty and rise up just above the foliage. AKS Redwood Sorrel or Oregon Sorrel. Long lived. Edible. Oregon native plant. Adorable, tiny scaled dense growing ground cover from Chile. 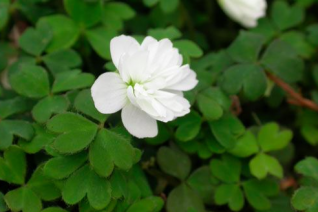 The most amazing component is the little pure white fully double flowers that appear all summer. They kind of hide in the foliage and its fun to search for them and pull them up above the leaves. Perfect little rosebuds. Slow spreading ground cover for part shade to full shade and rich, moisture retentive soil. Its not durable enough for life between pavers or hellstrips rather you plant it in a woodland under a shrub and notice how dainty and beautiful it is. Spreads out to about 1′ wide in 2 years. Deciduous in most winters- but it returns from the ground quickly in early spring. Protect from hot sun- it does not like. Lovely. Far and away our most vigorous clone of our native Oregon Sorrel. So named for the bright red underside of the leaves. In spring and sporadically into summer pure white flowers peek over the foliage. This is a fast colonizing plant that goes by underground stolons and it can cover several feet in a year. In time it will cover anything in part shade to shade in rich, hummus laden, moisture retentive soil. Piles up to about 6″ deep in no time. This form is decidedly evergreen. Use for wild areas to obstruct smaller weed growth- under decks, shady glens, other areas too dark for plants to grow. Oregon native plant. 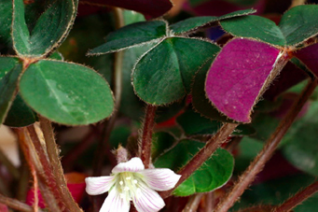 I found this form of our native Redwood Sorrel in a drier and hotter part of the Siskiyous than what is normally the range for this woodland plant. 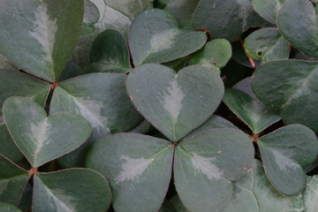 Large soft green leaves have a silver chevron in the center of each leaflet. In spring very large pale pink/lavender flowers appear with a central yellow eye. Very showy. ideal candidate for dry shade- give it mulch and plenty of water to established then this form seems much more drought and heat adapted than the familiar forms on the market. Forms a semi-evergreen ground cover in shade. Edible. Part shade, shade, regular summer water. Spreads underground by stolons. Oregon native plant.